Writers. Books. Readers. Three points of a strong triangle. In thinking about fiction craft, we inevitably think about the triangle of Writers & Books & Readers. This is the basis of publishing, whether books are distributed in paper or digital form. As writers, we want to attract readers and get our books into their hands. As readers, we want access to good books, and we hope to discover wonderful new authors, who seem to have written books just for us. As the publishing industry grows through its awkward digital adolescence, the Writers Books Readers triangle shifts shape. Along the line segments run the channels: Publishing Distribution Affinity. Affinity is my term for the crucial relationship between writers and readers. 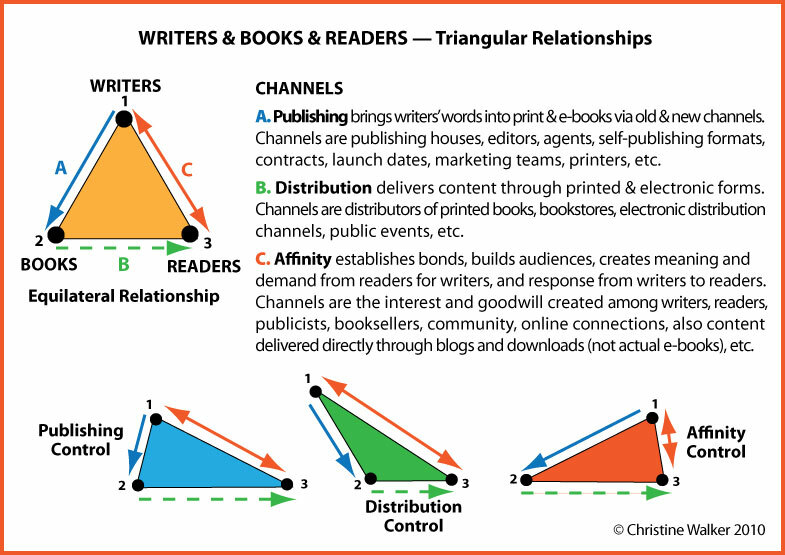 These segments (sides) of the triangle may be equal or unequal, but Writers Books Readers are always at the vertices. In the graphic above, I gave writers the top spot, even though only a handful of published writers may feel like they’re number one. But let’s face it. Without writers, there would be no books or readers. Publishing houses would be shuttered, bookstores vacated, distributors empty-handed. There would be no debate over printed books versus e-books, print versus download royalty contracts, or any contracts at all. However, by putting writers at top, I don’t diminish the importance in the publishing industry of the editing, formatting and delivery of books or the readers who buy or borrow the books. In an ideal world, the triangle of relationships would be equilateral. Writers benefit from an industry that values all points and all sides of the triangle. Authors need help focusing and editing their books and getting books to readers. In the non-equilateral examples above, the shorter sides of the triangles represent greater power, action, and control in that channel and between those relationships. Celebrity books may move quickly and easily through the channels because name recognition and big advances propel action. Lady Gaga and American Idol were new deal highlights this morning in Publishers Lunch. How can the average, hardworking writer compete?! Last week I attended two writer events and did a Meet & Greet in an independent bookstore, where I was promoting my Read to Write Workshops. I envisioned the Writers Books Readers triangle and mused on the changes in the world of publishing. On Thursday evening, agent Amy Rennert spoke at the Petaluma Writers Forum about her agency in particular and the publishing industry in general. She believes in “books that matter.” She painted a considered, but not bleak, picture and spoke about discussions she’s had with some of her authors about advances. She’s advised authors not to take the biggest advance in order that their books, especially first books, earn through and show a profit. Agents serve authors, as well as the publisher, by helping to negotiate deals that will create value for all concerned and affinity between writer and readers, even though agents receive less income on 15% of a lower advance. The advance amount has to be weighed against the perceived commitment of the publishing house. Does a higher advance mean a bigger commitment by the publisher to market the book? Sometimes yes, sometimes no. For career longevity, profit-consciousness is becoming key: authors do not fare well if their books lose money. They may be blamed for the publisher’s losses and not given a second chance. It takes time for an author to build an audience—to create affinity with his or her readers. The corporate publishing industry is driven by the bottom-line to please shareholders. A year is not much time for an unknown author to build an audience, but profits are reported quarterly and annually, and stock prices are watched daily. On Saturday afternoon, I observed and talked with book browsers and buyers in Copperfield’s, a bookstore in the heart of the Petaluma community. People entered and explored for free, perhaps purchased a book, card or magazine, and departed after a few minutes or more than an hour. While they were in the store, they appeared to be enjoying the intellectual, sensuous feast that this bookstore offers. They were searching, smiling, talking with a companion, questioning store employees, thumbing books, reading. A poster on display announced a Lisa See reading, which on Monday night attracted 60 people — a respectable showing for a free Monday night, small town event. From this exposure, regardless of sales, the author connects with and builds her audience for sales of her new release, as well as for past and future books. The store plays a key role in generating good will among readers and writers and for books in general. On Sunday at Redwood Writers, I heard Joe Quirk speak about his amazing good luck as a first novelist getting a powerful agent and lucrative contract, and then his equally amazing bad luck in how it all played out. He demonstrated his resiliency in advancing his book career despite setbacks beyond his control with his first best-selling novel, The Ultimate Rush. He’s written another novel, Exult (printed on demand or downloaded through Scribd), and two books of nonfiction, including It’s Not You, It’s Biology. Luckily for his audiences, his tribulations seem only to have sharpened his wit. I’ve heard many publishing woes over the years and could tell a few. The lessons Joe learned reiterate my own: when you’re an author signed with a big publisher for a big advance (though mine wasn’t as big! ), you still have to ask lots of questions, not take anything for granted, and do your own legwork to build your audience. He’s applying knowledge gained through painful experience to his now less spectacular traditional deals and new opportunities made possible by technologies, which are shifting publishing and distributions channels through self-publishing, print on demand, e-book downloads, and protocols we haven’t yet imagined. He’s establishing affinity through his engaging humor, as well as his writing. I want to repeat: Regardless of the shape-shifting in the industry, the three points of the triangle remain: Writers Books Readers. A writer is a person who has the ideas and skills and cares enough to take time—sometimes years— to write something that matters to him or her and a handful to millions of other people. A reader is a person who has the desire and ability to read the book produced and who chooses to spend his or her time in this pursuit rather in any number of other pursuits. A book can take many forms. It has long been an object. Centuries ago books were handwritten by a select cloistered few. In recent history, they have been carefully printed by letterpress or offset methods and bound in shapes and textures appealing to the touch, decorated in images and colors pleasing to the eye. Or they have been slickly mass produced at low cost for grocery aisle displays. Today they may not always be an “object.” They may only be code that activates a reading device to display what looks like ink on paper but isn’t. Or they may be spoken words heard by playing a compact disc or downloading an audio file to a computer. Tomorrow who knows? Maybe in my lifetime I’ll “read” or “hear” books via a chemical I ingest or a device implanted in my brain to receive transmissions. I hope I don’t live that long! I think (hope, believe) that books will be around as long as people are, and books that matter will matter even more. A book is a considered whole, but the digital age allows latitude with this. Books can be delivered chapter by chapter or as selections of chapters in a Mr.-Potato-Head style of MYOB (Make Your Own Book). Nonfiction books more easily fit this model than novels, but novels are being downloaded in chapters or published via blogs, tweeted 140 characters at a time, or text messaged. Serial form isn’t a new idea: Charles Dickens would have used our social media options. I’m a book lover who likes paper and ink, color and texture. I like holding a book in my hands, taking it to bed or easy chair, park or beach, plane or waiting room. 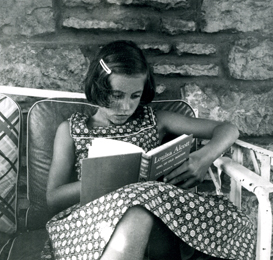 I’ve held books and loved them for as long as I can remember. I don’t doubt that I will some day purchase a digital book reader—a Kindle or Sony or iPad or whatzit—and load it up for a long trip. But I always envision a world with writers, readers, books and places where literary like-minds can meet.